Toilet Friend International (Pty) Ltd has developed a unique and environmentally-friendly solution for dealing with toilet bowl and urinal odours – and the best of all it all happens automatically! As an added benefit, Airborne Viruses and Bacteria are effectively removed from the toilet bowl before they escape into the room! We are often asked just how the System works. 1. The Sensor activates the system on demand. 2. Extractor Fan creates a partial vacuum above the water line. 3. Air is gently extracted out of the bowl via the flush-water ducts. 4. The foul-smelling, virus- and bacteria-laden air is expelled……into the sewerage pipe where it belongs! 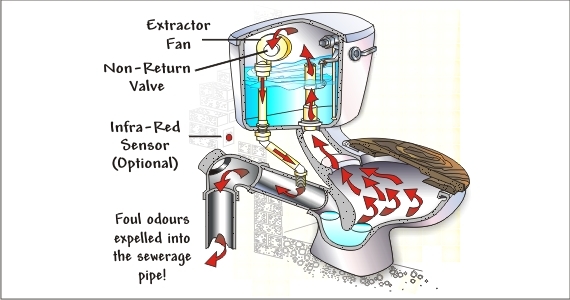 When the Toilet Odour Removal System is activated, the Motor drives the Extractor Fan causing air to be drawn from the toilet bowl via the water duct and overflow into the cistern. From here the air is expelled, either via the waste water pipe into the sewerage system or through the wall into the atmosphere, depending on the client’s preference. The Toilet Odour Removal System can be fitted to any existing toilet or urinal in about one hour. It completely does away with the need for CFC-propelled air fresheners and odour-masking sprays, making it an environmentally-friendly solution to an age old problem. « What does the Toilet Odour Removal System look like?